A comfortable room with a standard 4’6” (135cm) double bed. 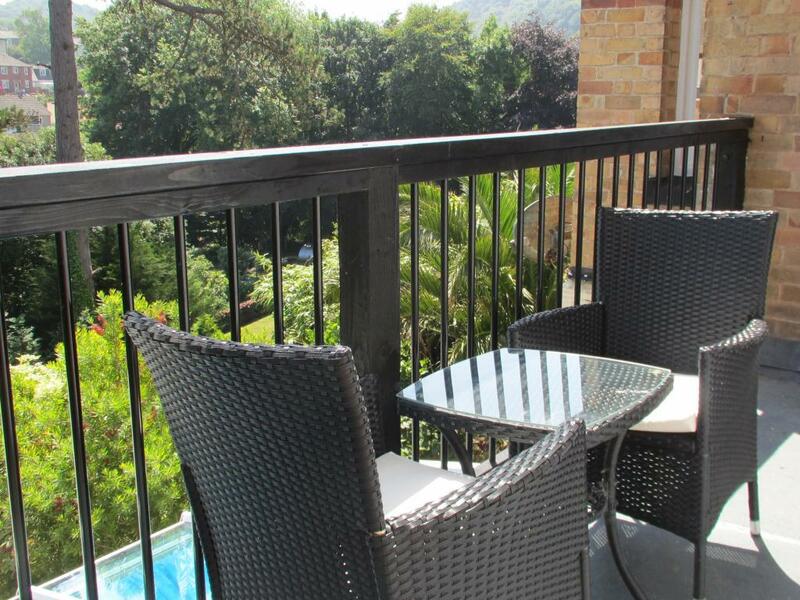 Situated on the sunny rear elevation of the building with views over our beautiful landscaped gardens. The room has a small en-suite with a shower, toilet and hand basin. 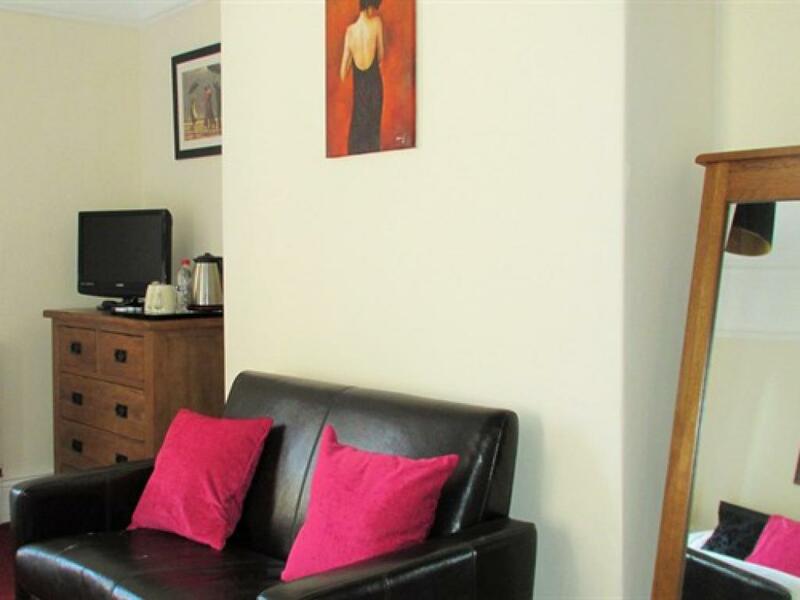 The room is equipped with a wardrobe, a chest of drawers with a vanity mirror, bedside drawers and lights, a small table with a complimentary room tray & kettle, a lounge chair, a wall mirror, a hair Dryer and a small TV & DVD player. Iron and ironing board are available on request. All of our rooms have crisp white Egyptian cotton bed linen, soft white fluffy towels, complimentary toiletries and are serviced daily. Iron and ironing board are available on request. A bath tub is available in the shared bathroom off of the same landing as this room. This room is located one floor up from the front door and is access via stairs with a half landing. Our twin room is situated at the front of the building and has two standard 3’ (90cm) single beds. The room has a small en-suite with a shower, toilet and hand basin. 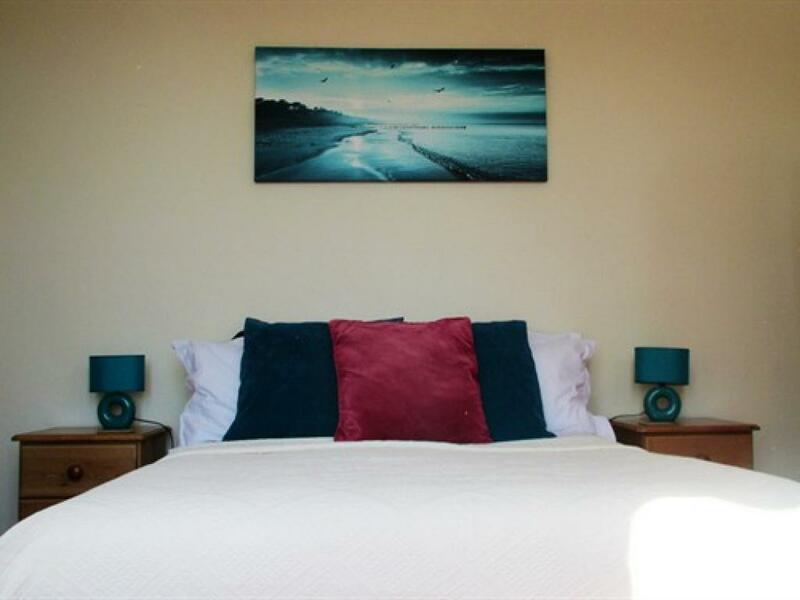 The room is equipped with wall space hanging for clothes, a chest of drawers, bedside drawers and lights, a small table with a complimentary room tray & kettle, a lounge chair, a full length wall mirror, a hair Dryer and a small TV & DVD player. Iron and ironing board are available on request. All of our rooms have crisp white Egyptian cotton bed linen, soft white fluffy towels, complimentary toiletries and are serviced daily. Iron and ironing board are available on request. A bath tub is available in the shared bathroom off of the same landing as this room. This room is located one floor up from the front door and is access via stairs with a half landing. 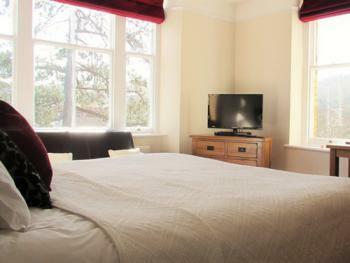 Our Superior room is more spacious than our standard double room and comes with a large comfy King-size 5’ (150cm) bed. 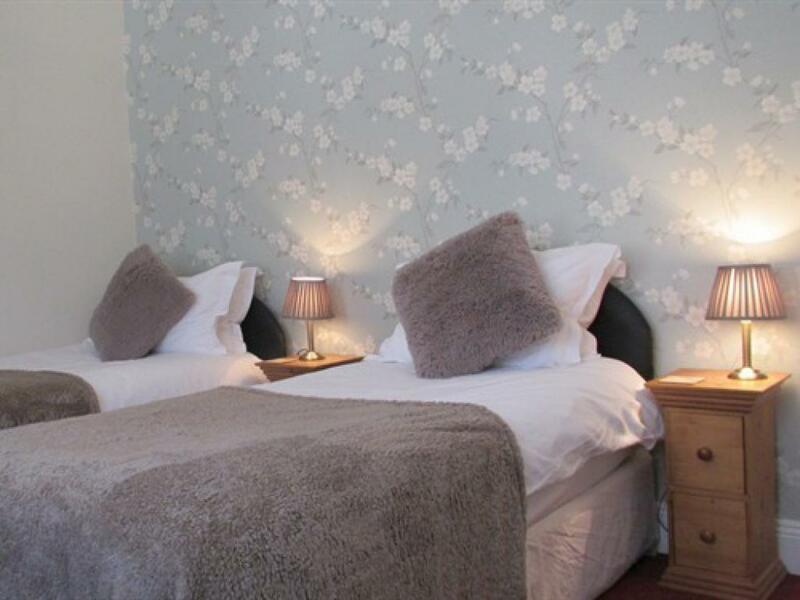 Situated on the sunny rear elevation of the building the room benefits from views over our beautiful gardens and across the valley. 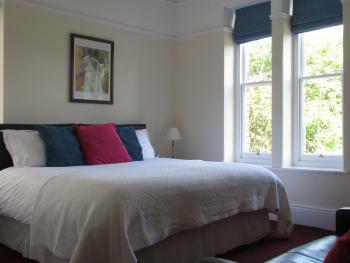 Our Superior room is en-suite with a large walk-in shower, toilet and hand basin. The room is furnished in oak with a wardrobe & large drawer, a dressing table with chair and vanity mirror, a complimentary room tray & kettle, bedside drawers and lights, a lounge chair, a wall mirror, a hair Dryer, a small TV & DVD player and a portable luggage rack. Iron and ironing board are available on request. All of our rooms have crisp white Egyptian cotton bed linen, soft white fluffy towels, complimentary toiletries and are serviced daily. Iron and ironing board are available on request. A bath tub is available in the shared bathroom at the other end of the guesthouse on the first-floor. This room is located one floor up from the front door and is access via stairs with a half landing. Our Deluxe rooms are our most spacious well-appointed rooms so you can relax in a quiet and more comfortable atmosphere. 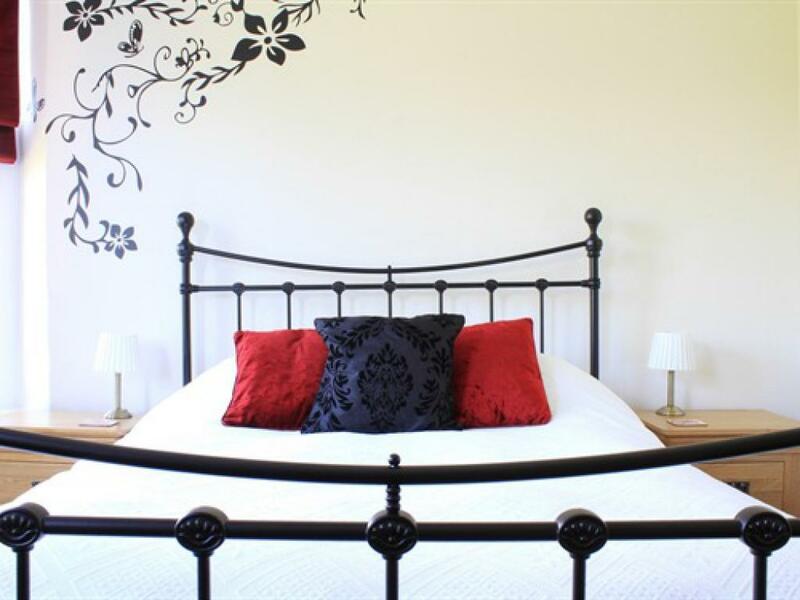 These rooms come with an enormous comfy super-king size 6’ (180cm) bed so they are ideal for that romantic break or longer stay. 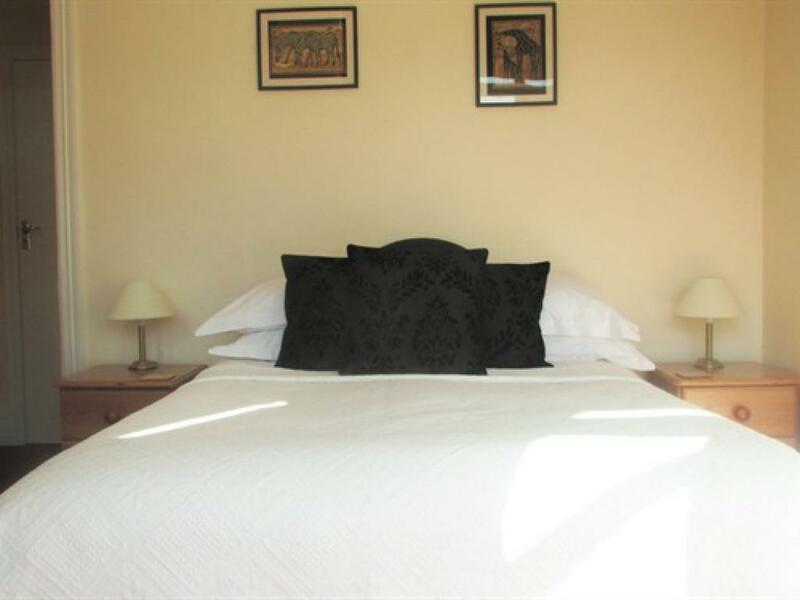 Situated on the sunny rear elevation of the building the room benefits from views over our beautiful gardens and across the valley. 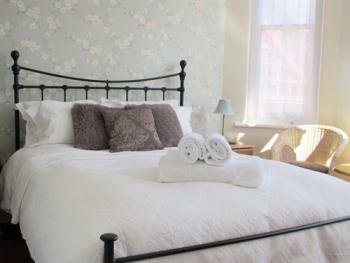 Our Deluxe room has a good size en-suite with a large walk-in shower, toilet and hand basin. The room is furnished in oak with a wardrobe, a chest of drawers, a dressing table with chair and vanity mirror, a complimentary room tray with lots of goodies & a kettle with fresh coffee making facilities, bedside drawers and lights, a small two-seater sofa, a free standing full-length mirror, a wall mirror, a hair Dryer, a larger TV & DVD player and a portable luggage rack. Iron and ironing board are available on request. All of our rooms have crisp white Egyptian cotton bed linen, soft white fluffy towels, complimentary toiletries and are serviced daily. Iron and ironing board are available on request. A bath tub is available in the shared bathroom at the other end of the guesthouse on the first-floor. This room is located one floor up from the front door and is access via stairs with a half landing. Our Superior balcony room is more spacious than our standard double balcony room and comes with a large comfy King-size 5’ (150cm) bed. Situated on the sunny rear elevation of the building the room benefits from a balcony with views over our beautiful landscaped gardens. 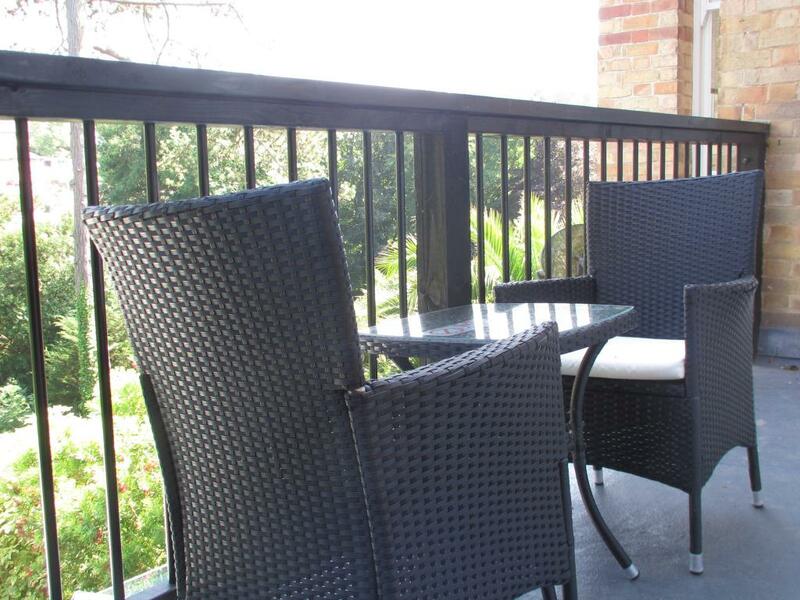 The balcony is equipped with a table and 2 chairs so that you can enjoy a morning cup of tea - or an evening glass of wine - outside in our fresh Devon air. Please note that we do not permit smoking on the balconies. 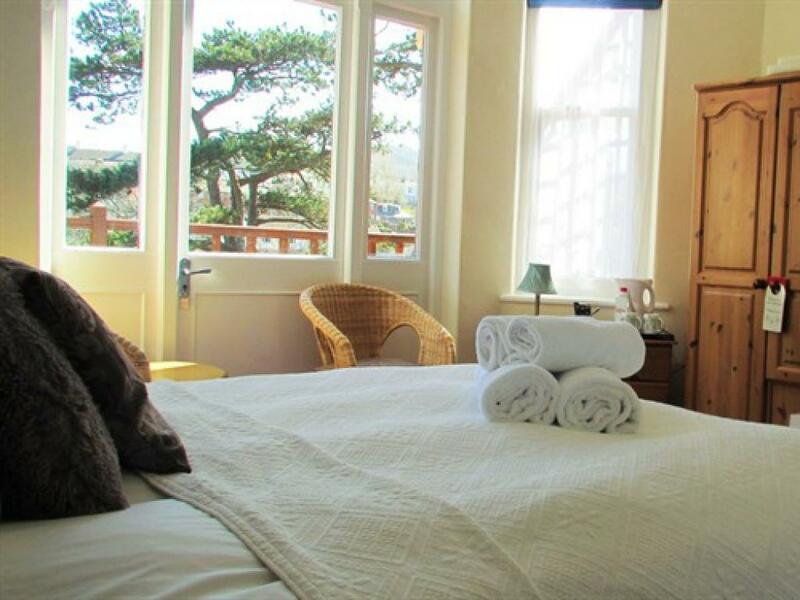 Our Superior balcony room is en-suite with a large walk-in shower, toilet and hand basin. 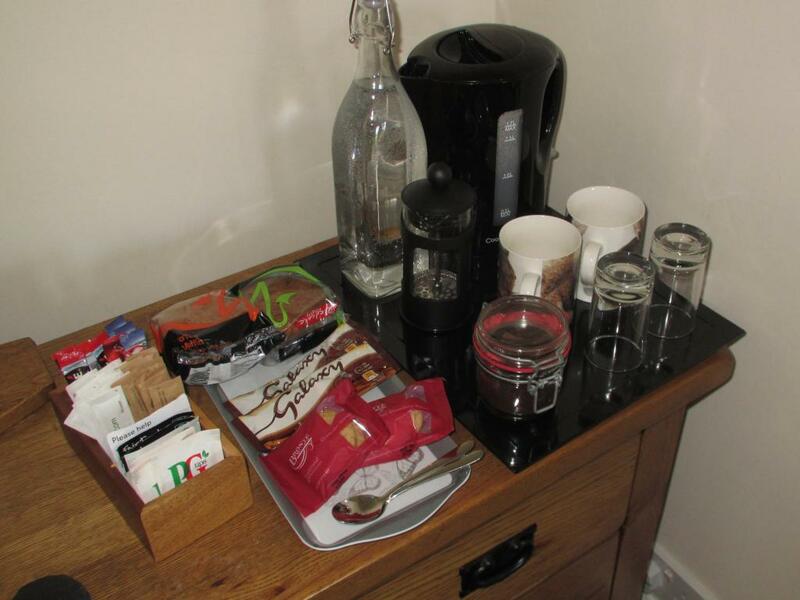 The room is equipped with a wardrobe, a chest of drawers with a complimentary room tray & kettle, bedside drawers and lights, a table and lounge chair, a full-length wall mirror, a hair Dryer and a slightly larger TV & DVD player and a portable luggage rack. Iron and ironing board are available on request. All of our rooms have crisp white Egyptian cotton bed linen, soft white fluffy towels, complimentary toiletries and are serviced daily. Iron and ironing board are available on request. A bath tub is available in the shared bathroom at the other end of the guesthouse on the first-floor landing. This room is located on the same level as the front door and the breakfast room. The corridor to the room has a step down and a step up again. 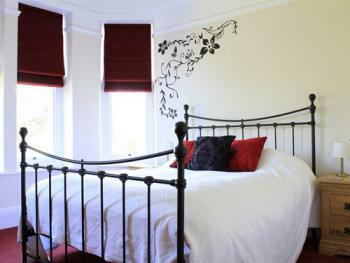 A comfortable room with a standard 4’6” (135cm) double bed. 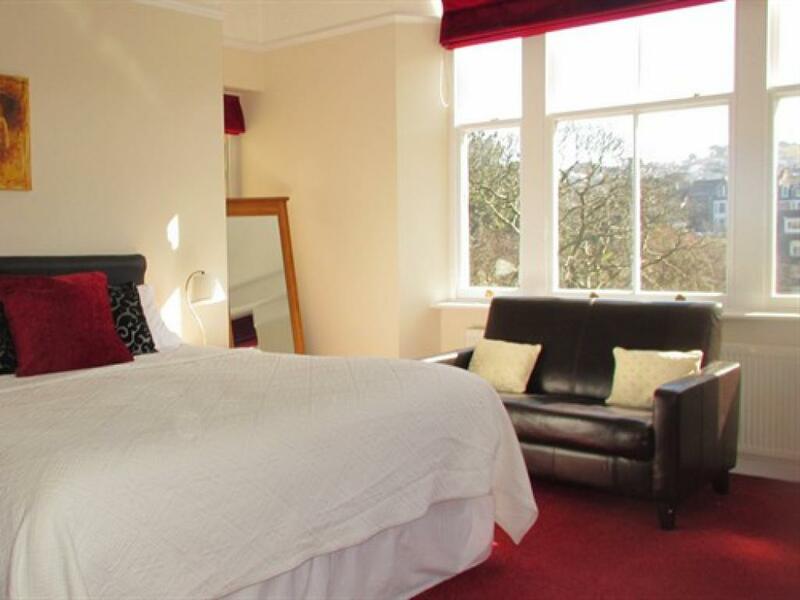 Situated on the sunny rear elevation of the building the room benefits from a balcony with views over our beautiful landscaped gardens. 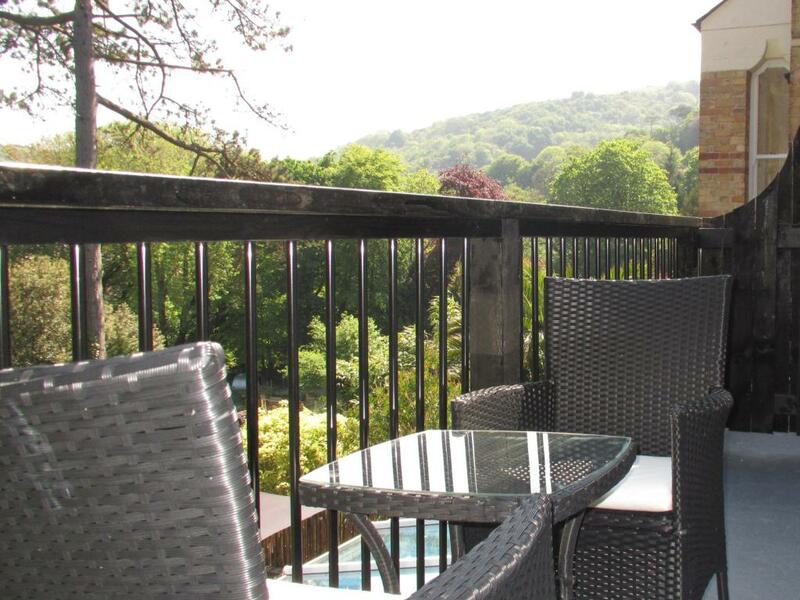 The balcony is equipped with a table and 2 chairs, so that you can enjoy a morning cup of tea - or an evening glass of wine - outside in our fresh Devon air. Please note that we do not permit smoking on the balconies. The room has an en-suite with a large walk-in shower, toilet and hand basin. 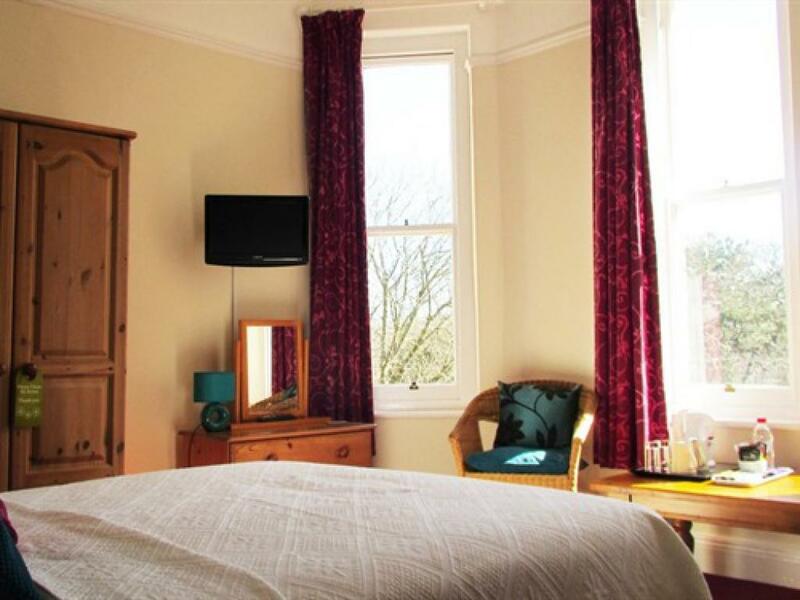 The room is equipped with a wardrobe, a chest of drawers with a complimentary room tray & kettle, bedside drawers and lights, a lounge chair, a wall mirror, a hair Dryer and a small TV & DVD player. All of our rooms have crisp white Egyptian cotton bed linen, soft white fluffy towels, complimentary toiletries and are serviced daily. Iron and ironing board are available on request. A bath tub is available in the shared bathroom on the floor above this room. This room is located on the same level as the front door and is adjacent to the breakfast room. Our Deluxe rooms are our most spacious well-appointed rooms so you can relax in a quiet and more comfortable atmosphere. These rooms come with an enormous comfy super-king size 6’ (180cm) bed so they are ideal for that romantic break or longer stay. Situated on the sunny rear elevation of the building this room is triple aspect with large windows and benefits from views over our beautiful landscaped gardens and up the valley into the distance. 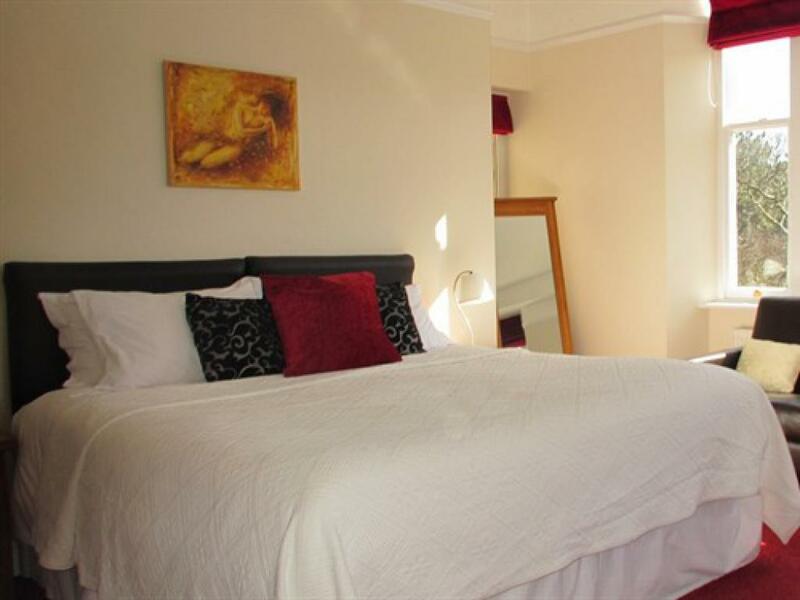 Our Deluxe room is en-suite with a large walk-in shower, toilet and hand basin. The room is furnished in oak with a wardrobe, a chest of drawers, a dressing table with chair and vanity mirror, a complimentary room tray with lots of goodies & a kettle with fresh coffee making facilities, bedside drawers and lights, a small two-seater sofa, a free standing full-length mirror, a wall mirror, a hair Dryer, a larger TV & Blu-ray player and a portable luggage rack. Iron and ironing board are available on request. 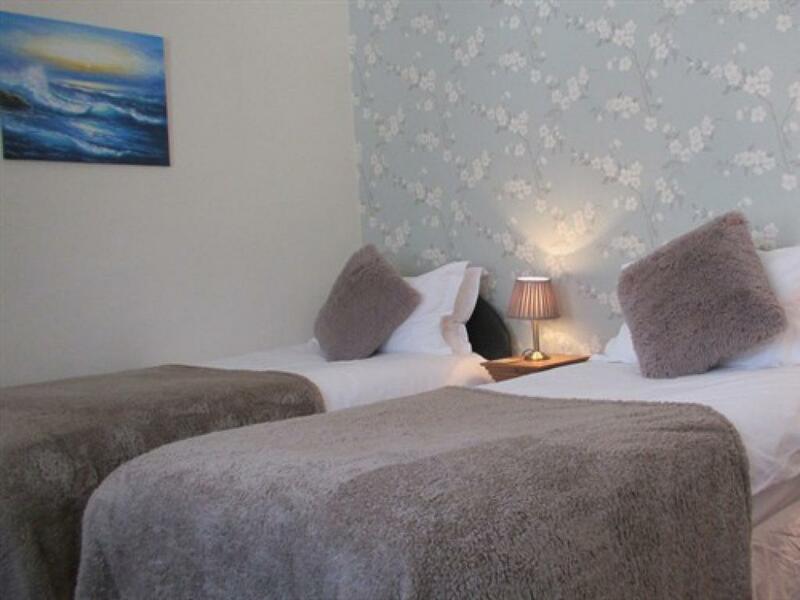 All of our rooms have crisp white Egyptian cotton bed linen, soft white fluffy towels, complimentary toiletries and are serviced daily. Iron and ironing board are available on request. A bath tub is available in the shared bathroom off of the same landing as this room. This room is located one floor up from the front door and is access via stairs with a half landing.